Sitting in the lines of traffic on the way to the finale of the 2012 British Touring Car Championship at Brands Hatch, it struck me that I hadn’t been to a BTCC for race for over two years – a shocking statistic for someone who used to regular attend at least two or three rounds a year for well over a decade. 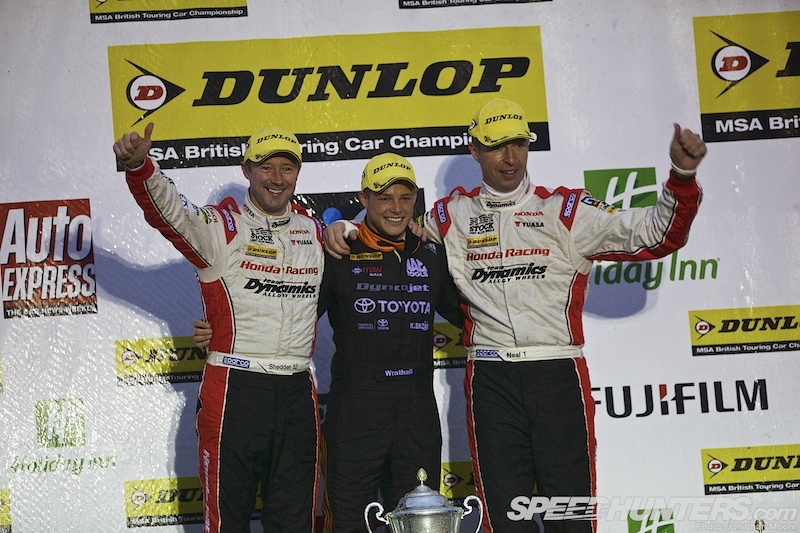 I have watched every round on TV though, and enjoyed all 27 races that had led up to this last trio of battles for 2012, mostly on the edge of my seat and often out of it, jumping up at another audacious, risky or downright idiotic overtaking move being pulled off around the cream of the UK’s circuits. 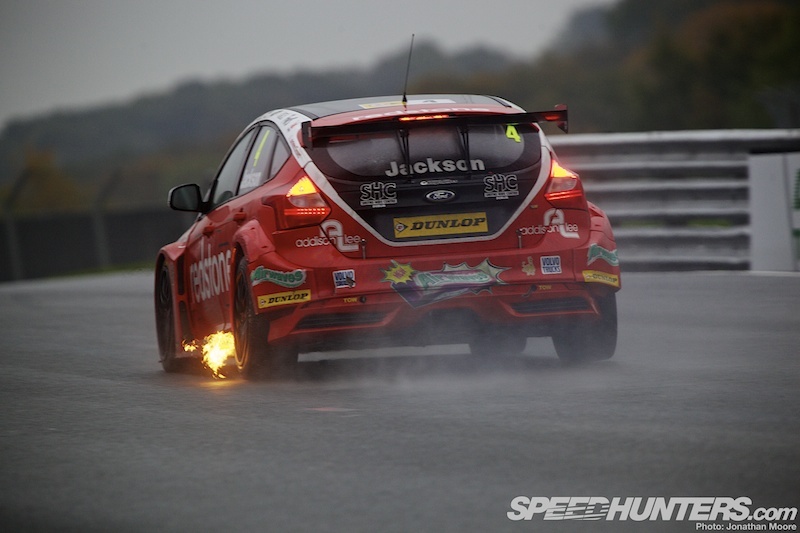 Four drivers went into the final weekend still in with a chance of taking the championship – a typical situation for the BTCC. Three Honda Civics would be slugging it out with an MG6. It made the potential for this round even more explosive. Arriving at Brands Hatch is always a bit like coming home: I’ve been watching races at this, my local track, since I was a child, but it’s a place that never becomes boring. The layout is second to none: the natural amphitheatre of the Indy circuit was extended out into the forest for the finale with the rare use of the majestic Grand Prix extension. The weather was predicted to be miserable, and so it came to be on race day. 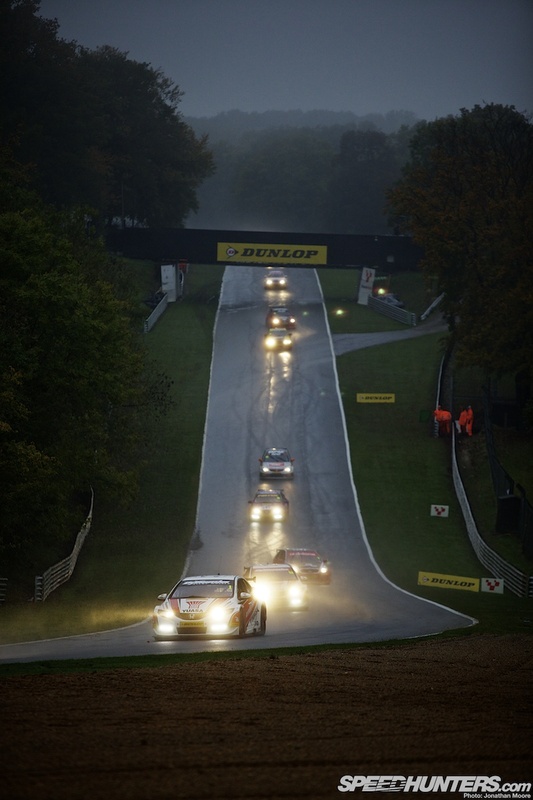 A cold track, steady drizzle and a descending mist as the day wore on created a set of hazardous conditions for the drivers to cope with. Did that stop the crowds coming out? On the contrary. 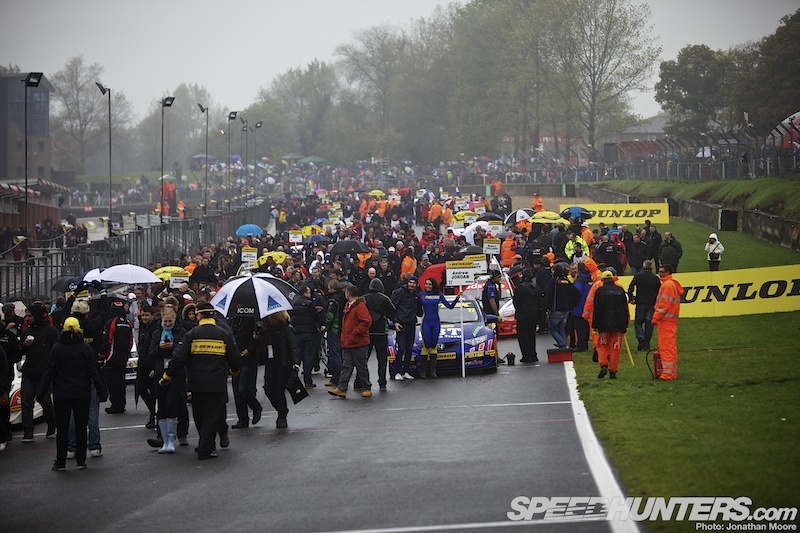 The fences were lined and the stands full as the cars took to the grid, race radio blaring out of the PA system. 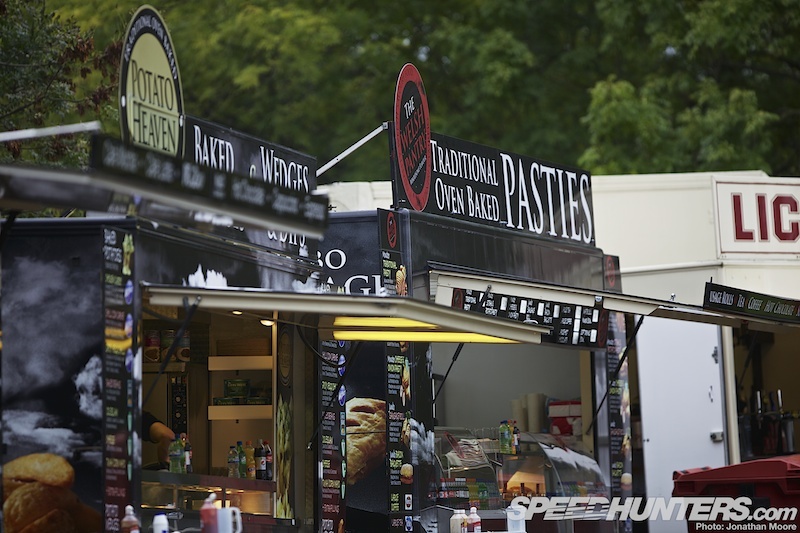 The promise of hearty pasties and donuts also helps keep up fans morale. 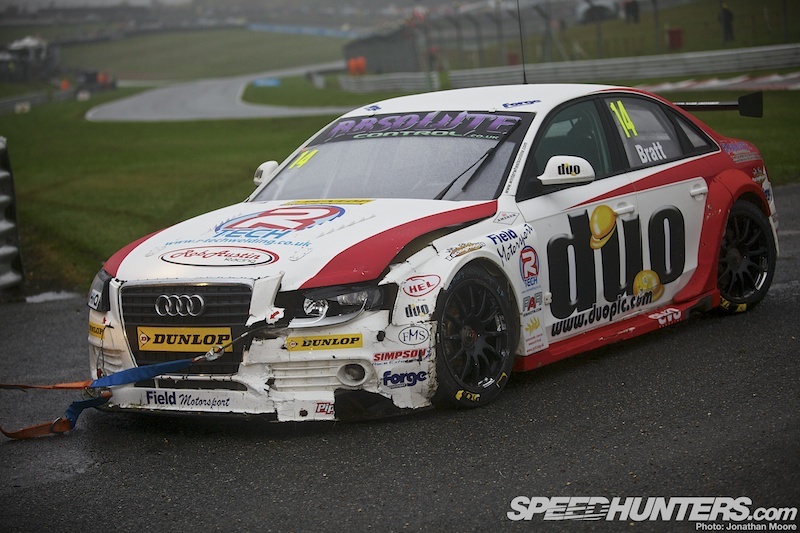 Walking down the pit-lane for Saturday’s qualifying, the first thing to strike me was the reminder of the level of professionalism across the whole BTCC paddock. 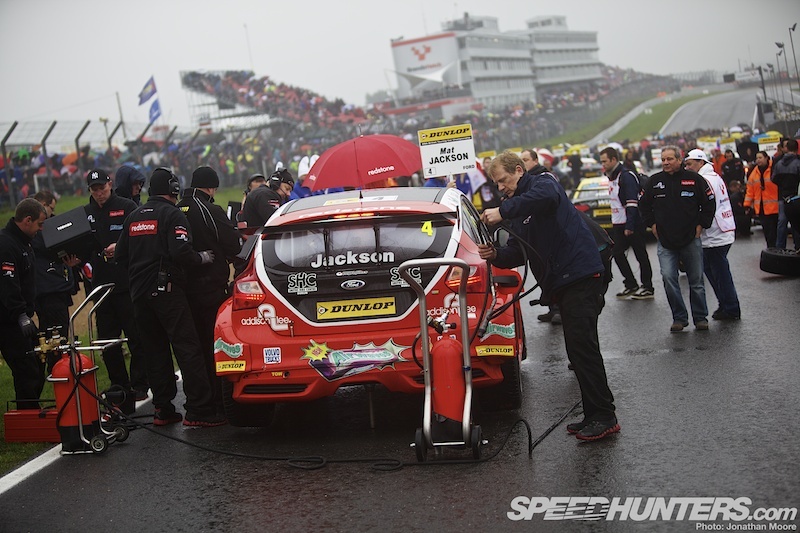 The grid is quite large – well over 20 cars have competed at all the rounds this year – but without exception the garages were all models of perfection. 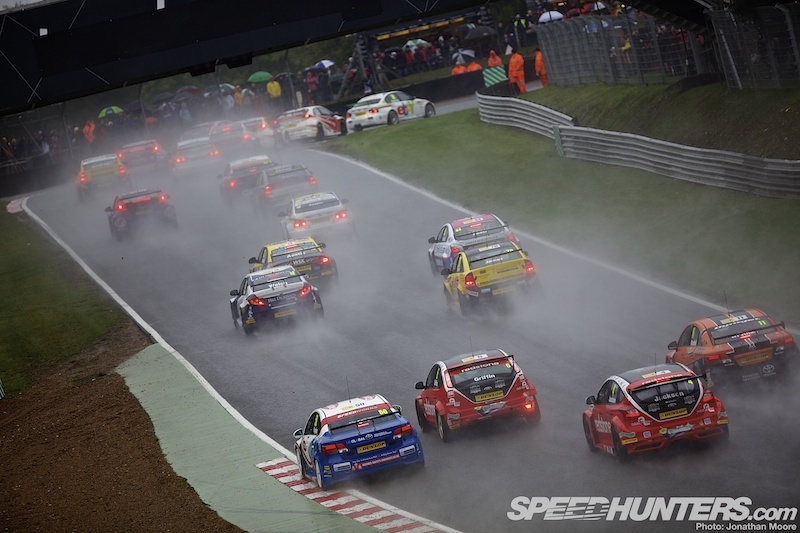 With its big audience figures and live TV broadcast the BTCC is a serious series to compete in, which means the series organisers’ expectations of the competitors is high – and not just for the factory-backed teams. From the front of the grid to the back, the cars are all prepared to an exceptionally high level and the teams’ presentation immaculate (if occasionally with unorthodox touches): all team members in branded gear, big race-trucks parked out the back of the pit garages and large hospitality units heaving with guests. 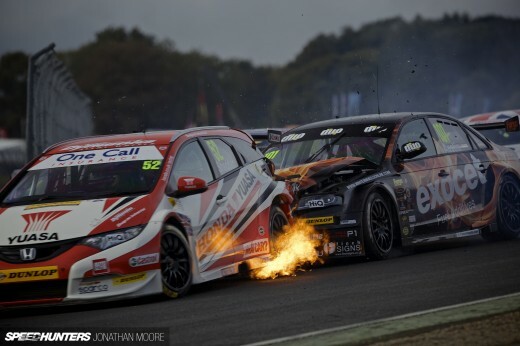 It’s the latter which is the important fact: rather like the American Le Mans Series, the BTCC is geared towards its fans rather than just the teams. The championship isn’t the premier category in the UK without reason. 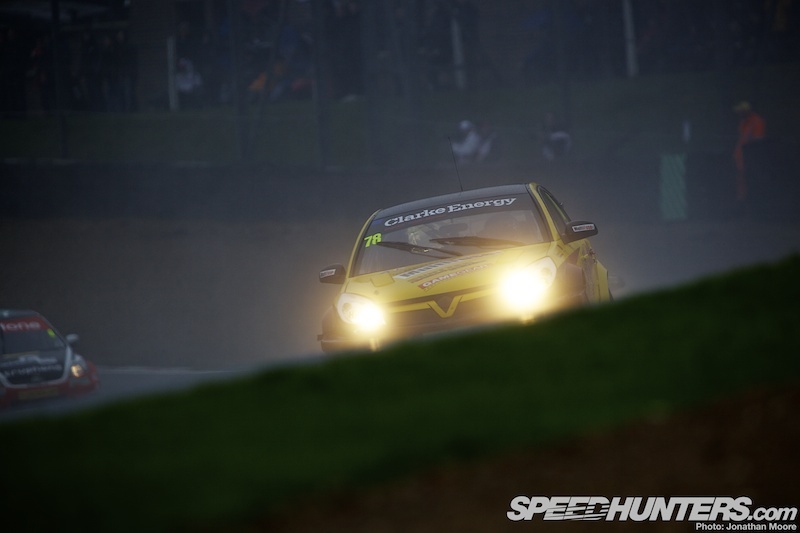 With the WTCC being rather at sea recently and big manufacturers depth-charging the series by their dropping in and out at will, the BTCC has steered its own course. 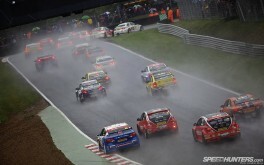 They deliberately diverged from the increasingly expensive FIA S2000 regulations last year and ignored the new 1.6-litre turbo spec to create a set of national rules that have not only brought more competitors to the series but also encouraged the spectators to flood back through the gates again, just like in the series’ heyday of the 1990s. 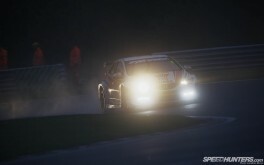 The Next Generation Touring Car rules have introduced bigger, more muscular-looking cars – in the main a return to larger four-door models that prove both popular with the fans and more hardy in combat – alongside a set of cheaper, centrally supplied spec parts and the move to a more powerful two-litre turbocharged engine formula. 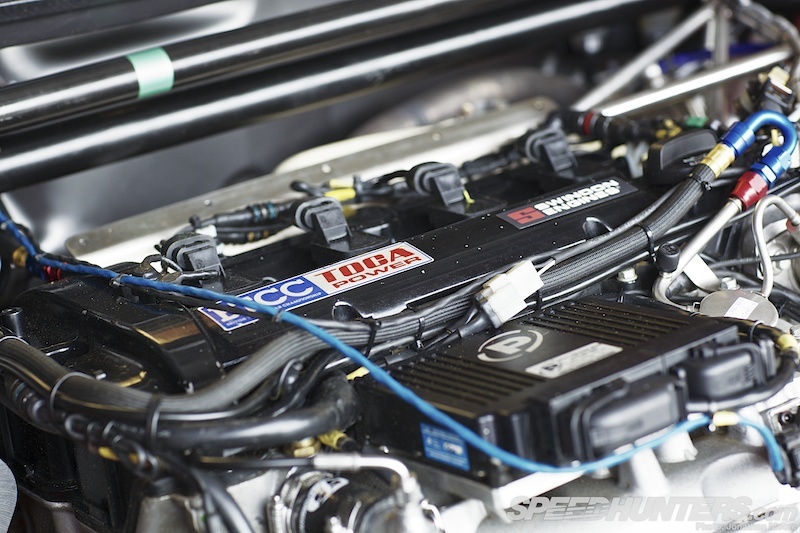 The TOCA engines were first flight-tested in 2010 by a couple of independent teams, but the NGTC rules proved a bigger hit than anyone was expecting. TOCA spec parts are one thing, but I still don’t think many people predicted the number of new cars that turned out last year. A Toyota Avensis had been used as a test mule for the rules pack – many ‘artists impressions’ circulated of how the car would look in the racing flesh, and it was certainly impressive: a big, meaty touring car, fat with body kit and wings, looking aggressive and purposeful. That the almost exact same car rolled onto the grid in early 2011 was quite a surprise, and a very pleasant one at that. Even better was that these were run by teams that were by no means known as big-name organisations like RML or Triple 8 – the NGTC rules were allowing modest racing teams to become constructors in their own right; an amazing step. 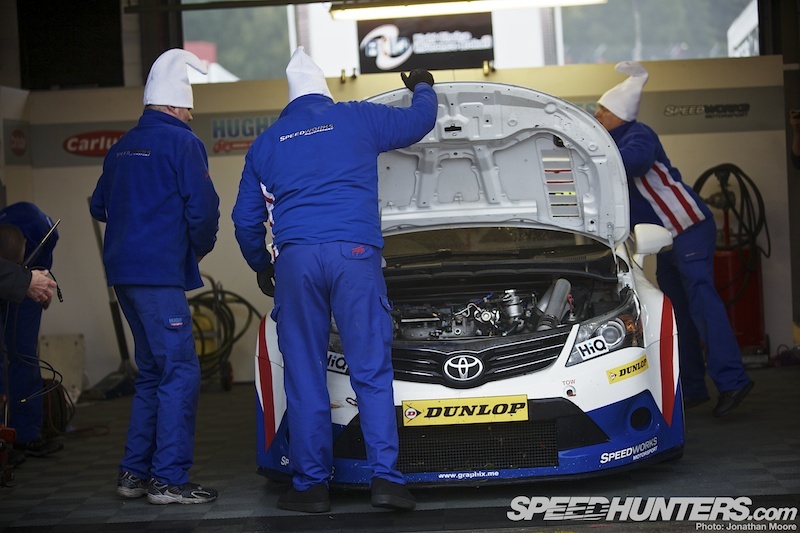 The Toyota was joined by an Audi A4, Proton Gen-2 and Vauxhall Insignia through the 2011 season, with Avensis showing particularly well during the middle of the year. 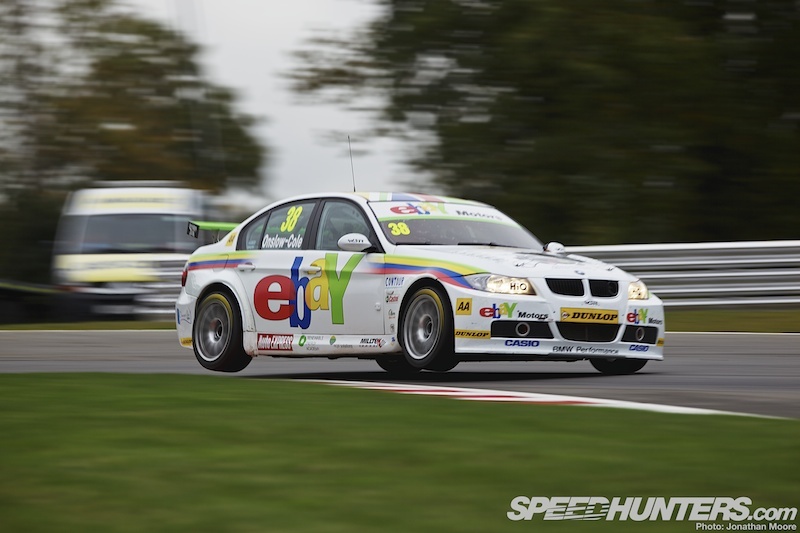 For 2012 the big guns switched allegiance as well: engineering leviathans Triple-8 and Team Dynamics both came out of the blocks with NGTC cars – the former unexpectedly with a brand new MG6 model and the latter with a steroidal ninth-gen Civic. As usual these two slugged it out at the front, but they were never alone up there. 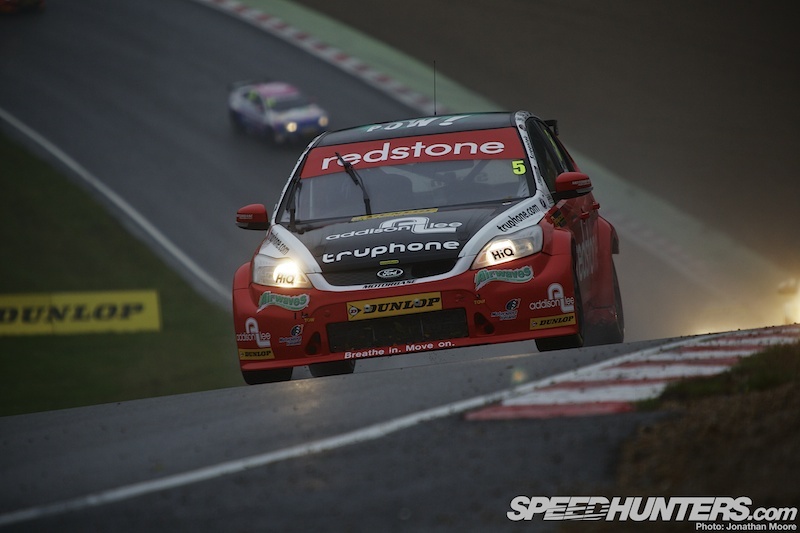 The vindication for NGTC as a concept was the debut win for the privateer Avensis in the final race at Brands of 2012, after over a year of oh-so-near results and following on from a victory for Motorbase’s NGTC Ford Focus ST MkIII at the previous round at Silverstone. 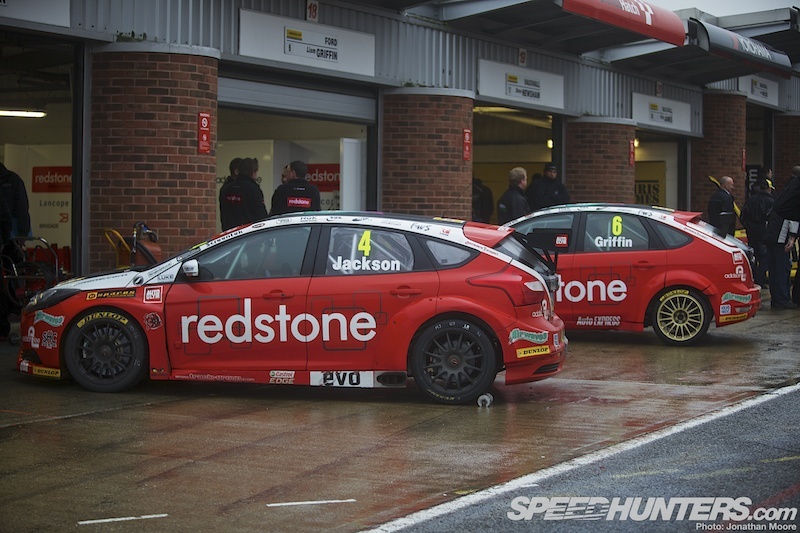 Motorbase continued to run a pair of S2000 Focus alongside their new MkIII. 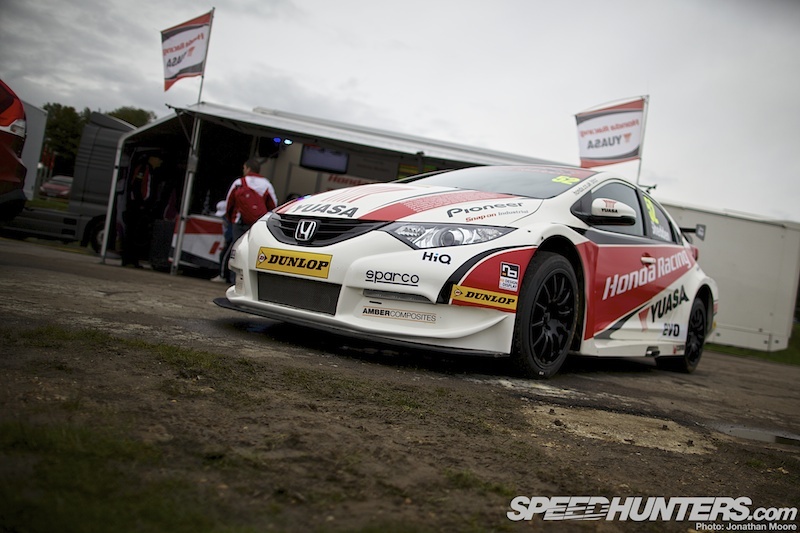 A successful racing series always needs personalities, and that’s something the BTCC has never lacked for. The series always promotes its drivers to the fore – the cars are vehicles in every sense for their antics. The mix of drivers at the moment seems to be just right: there’s strength in depth and charisma all through the field. At the front are the crowd favourites: the grizzled veterans and champions who are embedded into the consciousness of most UK racing fans in a way that only Formula 1 beats. 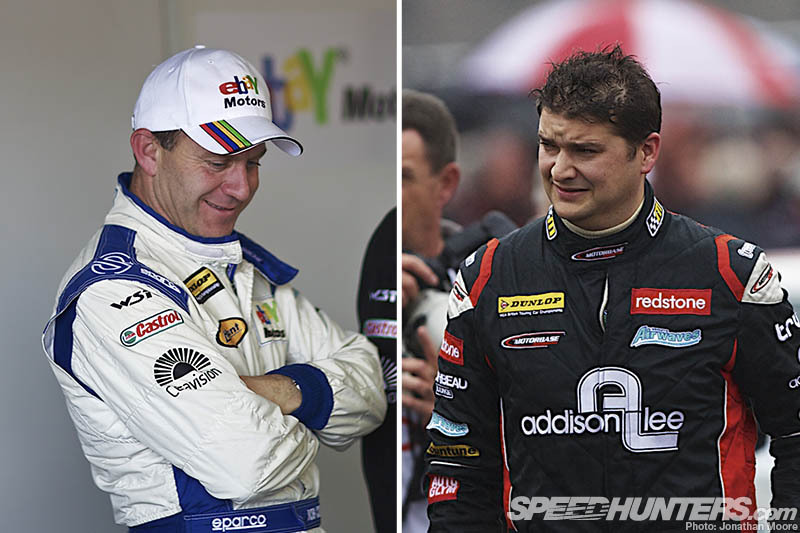 Jason Plato, the two-time champion (left), and his arch nemesis Matt Neal, a three-time champion (right), are the main protagonists. Their decade-long battle has continued on and off the track, spilling into post-race interview fisticuffs on occasion! 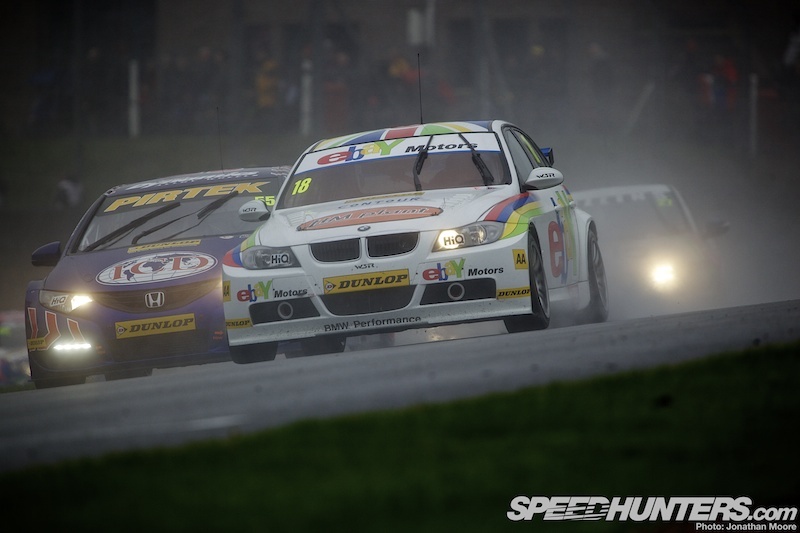 Racing at the front with them are Gordon Shedden (Matt Neal’s Dynamics Honda team-mate), Rob Collard (WSR BMW. left) and Ford’s Mat Jackson (right). The latter is also a test driver for McLaren’s road car division. 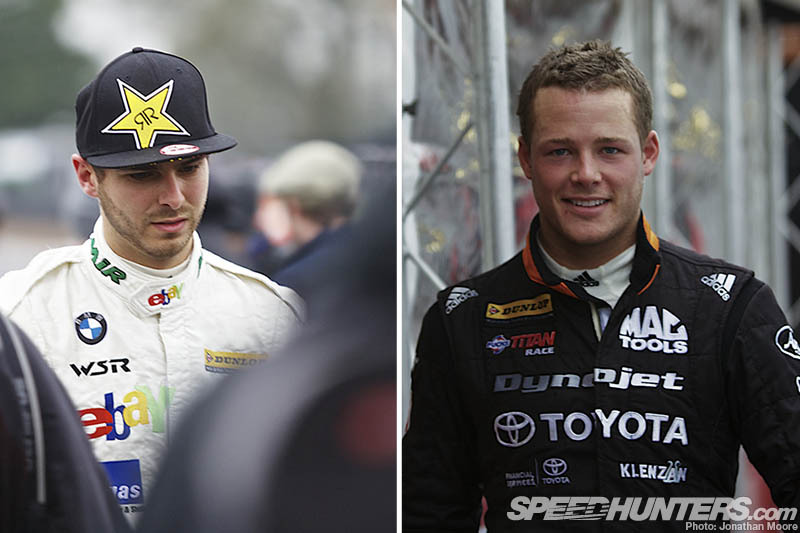 Then there is the new breed of young guns who have worked their way up through the ranks, drivers like Andrew Jordan (Pirtek Honda), Tom Onslow-Cole (WSR BMW, left), Árón Smith (Motorbase Ford) and Frank Wrathall (Dynojet Toyota, right). 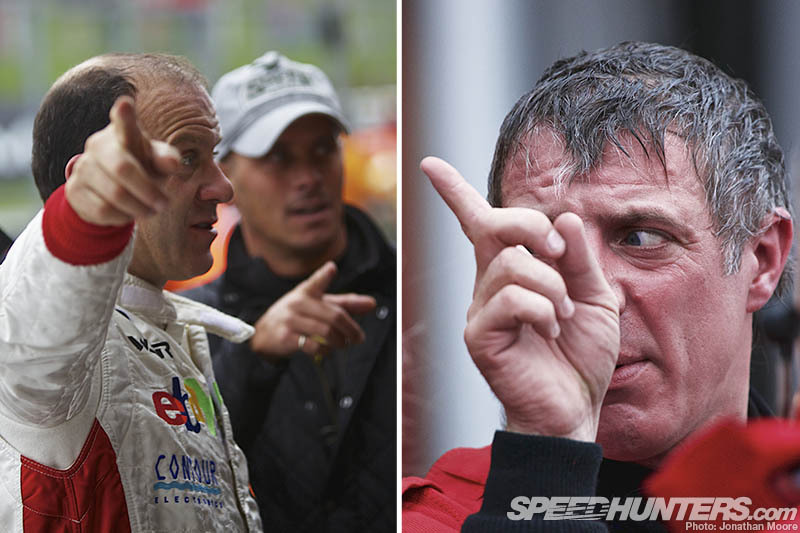 The frantic action of the series means that there’s frequently a lot of finger pointing after races, especially with TV interviews as a platform for spleen-venting. 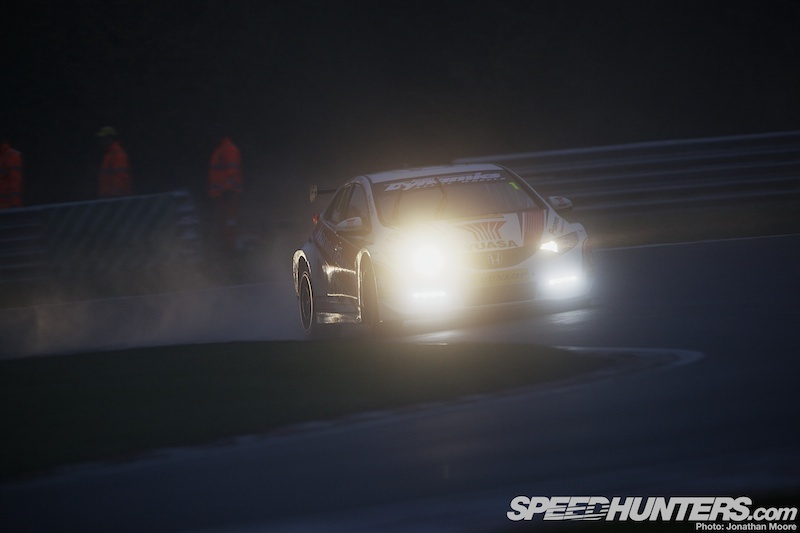 Thanks to the NGTC rules, drivers like Rob Austin and Dan Welch have entered their own, self-built cars – the Audi and Proton respectively. 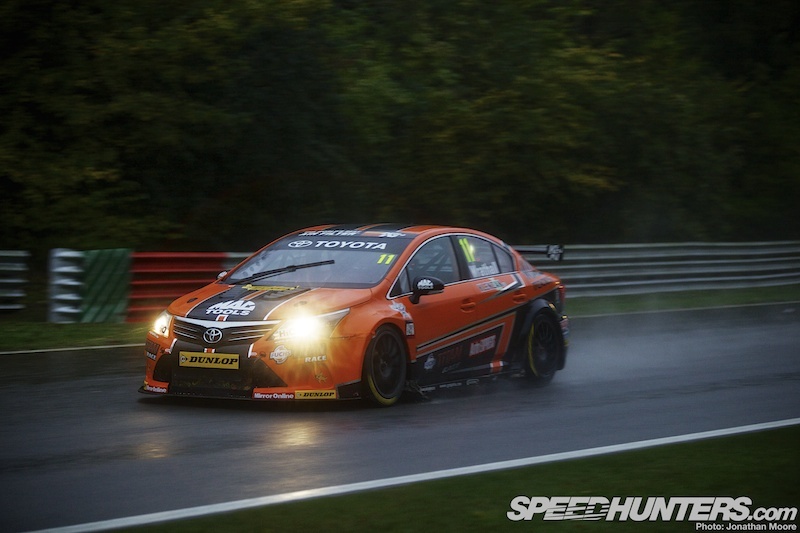 These are fantastically impressive entrants – both cars have become regular visitors to the top 10 as the season has progressed, with Rob Austin racing adding a second A4. 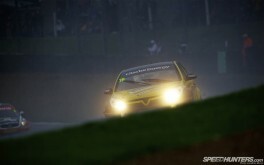 Backing them up are a number of older, semi-professionals who are the backbone of the series: ES Racing’s Dave Newsham has shone this year in his ex-Triple 8 Vauxhall Vectra and WSR’s Nick Foster has been on the heels of his fast more experienced BMW team-mates. 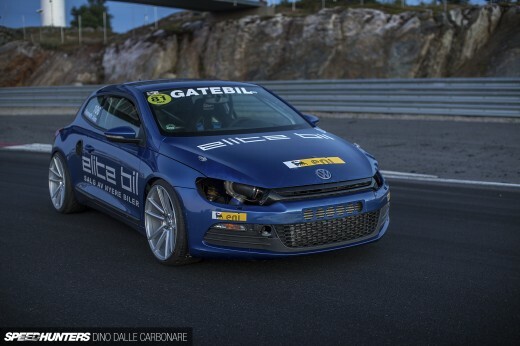 Like the drivers, the cars are also eclectic and the results never predictable. 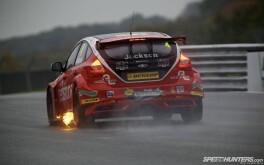 The BTCC has stayed away from rash changes, and introduced NGTC in a sensible, supported fashion. Those new cars race equally alongside older S2000 cars, some of which are ‘hybridised’ with NGTC components – particularly engines. These two classes create no separate tiers out on track: the performance windows for the NGTC and S2000 cars do differ, but overall lap-times are incredibly close. 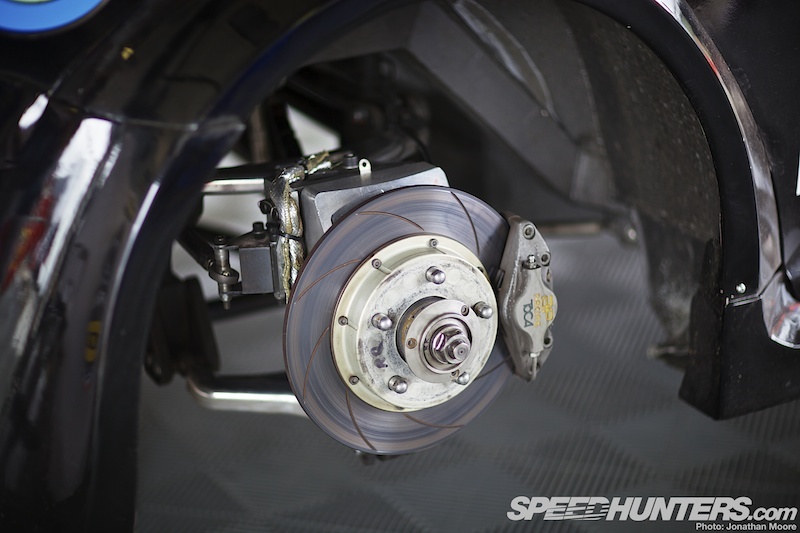 The larger tyres and brakes on the NGTCs tend to make them stronger in the closing stages of races, but the sleeker, developed S2000s often have the advantage in the opening laps – especially when combined with the BMW’s stunning standing-start performance. Performance balancing has been controversial, but effective. 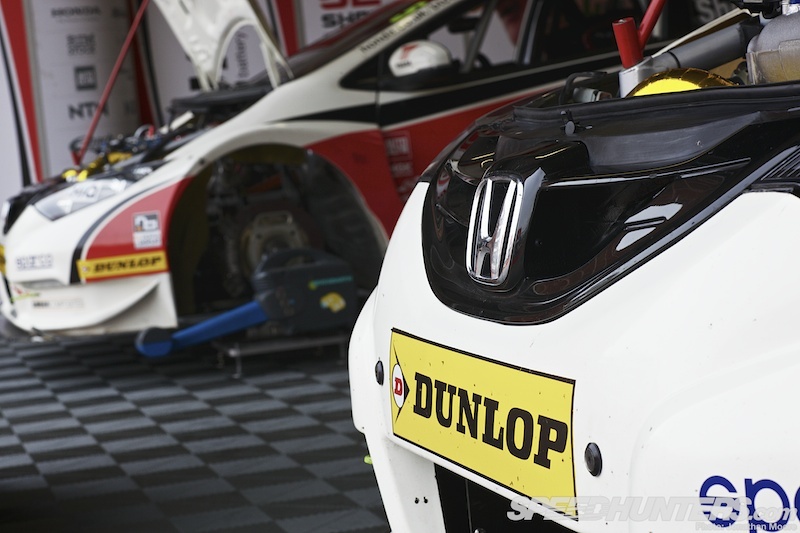 The door isn’t coming down on S2000 quite yet either: the BTCC are not only retaining the rules set, which keeps the number of eligible cars large, but even encouraging continued S2000 participation with the introduction of an S2000 trophy for 2013. 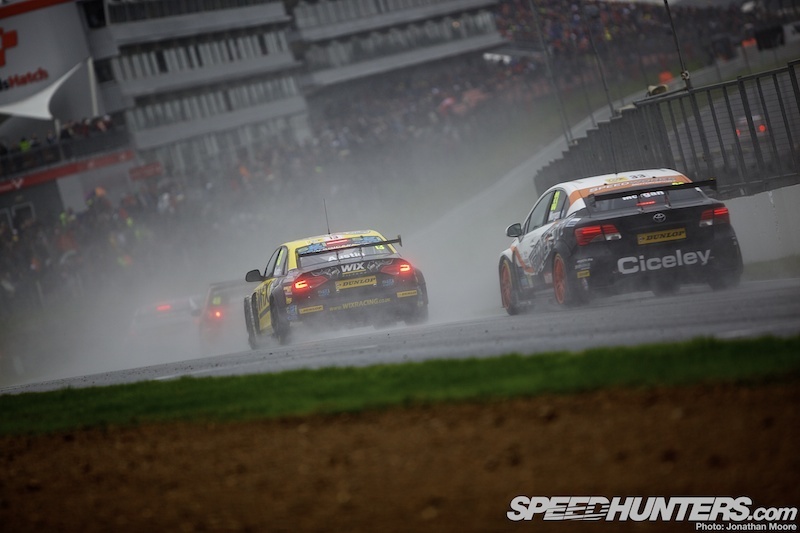 At a time when many major series are squabbling between the themselves and introducing expensive new rules at the drop of a hat, the BTCC’s broad church approach looks set to pay dividends. 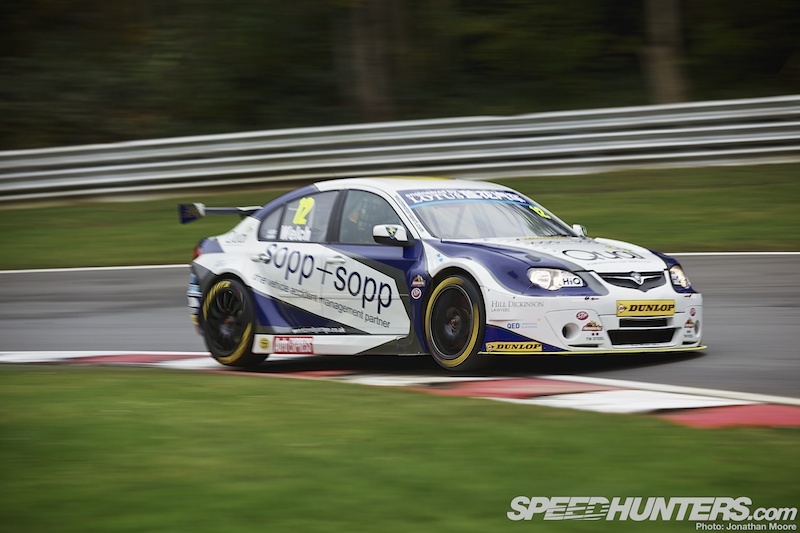 Older cars like the Triple 8 Vectra, which hoovered up wins during its factory-entered era, is still a handy weapon: Newsham has been stunningly quick in the Vauxhall, even taking two wins during 2012. 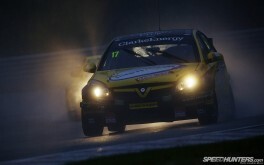 The Vectra is a real battleship of a touring car: the pointed fenders are made for battering-ram BTCC contests. One noticeable trait with the Vectra is the huge angle of camber they run on the rear wheels, far more than any other car. Although the Golf is rather small compared to the rest of the field, and more in tune with the compact hatchbacks of the mid-2000s BTCC, it’s still been been great to see the AMD team field a GTI, keeping alive a tradition of racing VWs and the David vs Goliath battles of old. 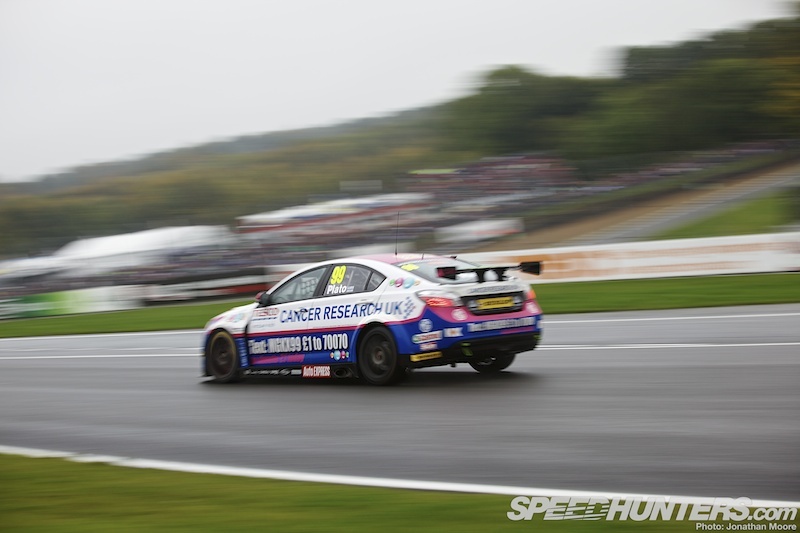 The BTCC has always had eclectic and well-subscribed supporting series, meaning that there’s constant track action over the two days of each round. 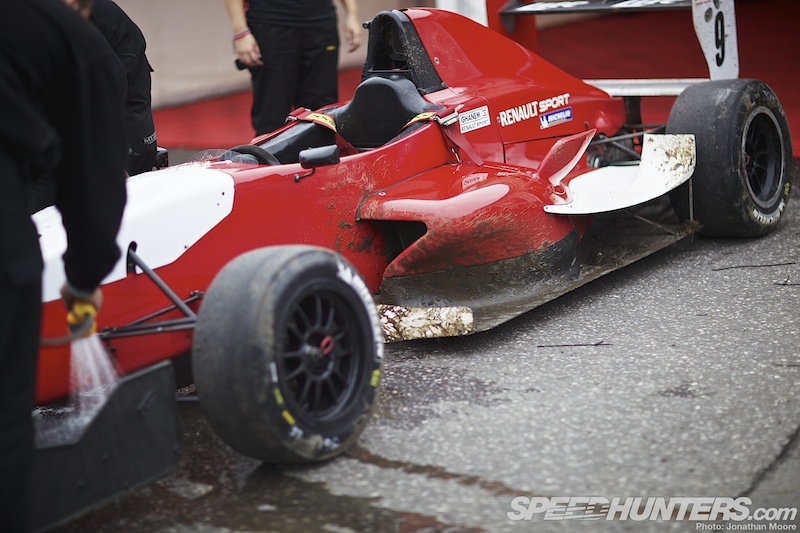 The entire package is a breeding ground for new talent across a whole section of racing disciplines: single seaters, GTs and saloons. 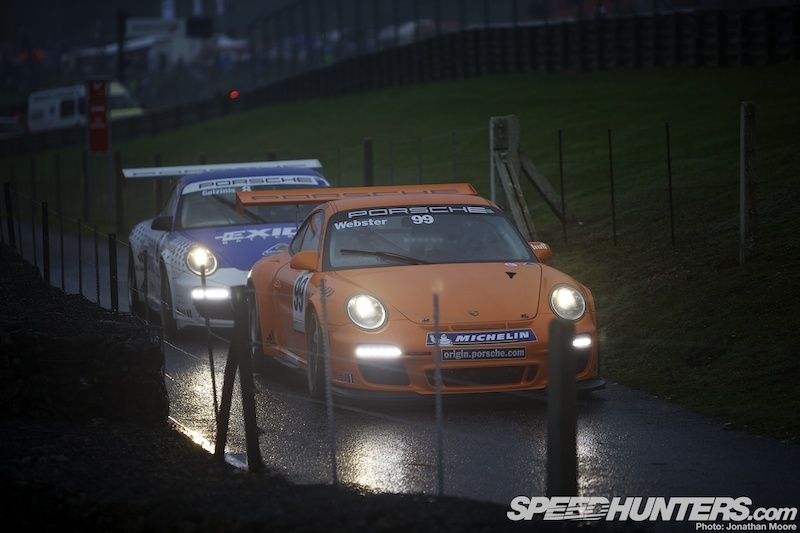 The Porsche Carrera Cup has an armada of GT3 Cups battling for the prize of a 911 for a year. 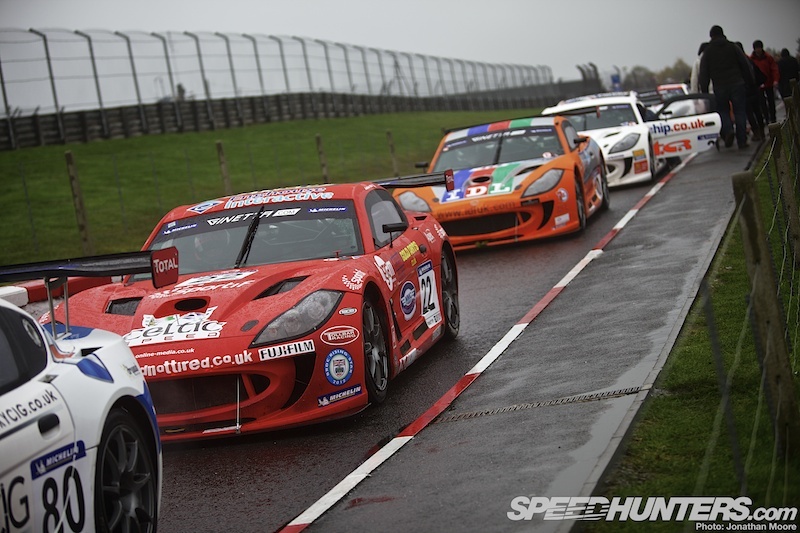 Ginetta have two slots on the BTCC billing: the Ginetta Juniors is a series for youngsters to cut their teeth in nippy G40s. And I mean youngsters in the almost foetal sense. 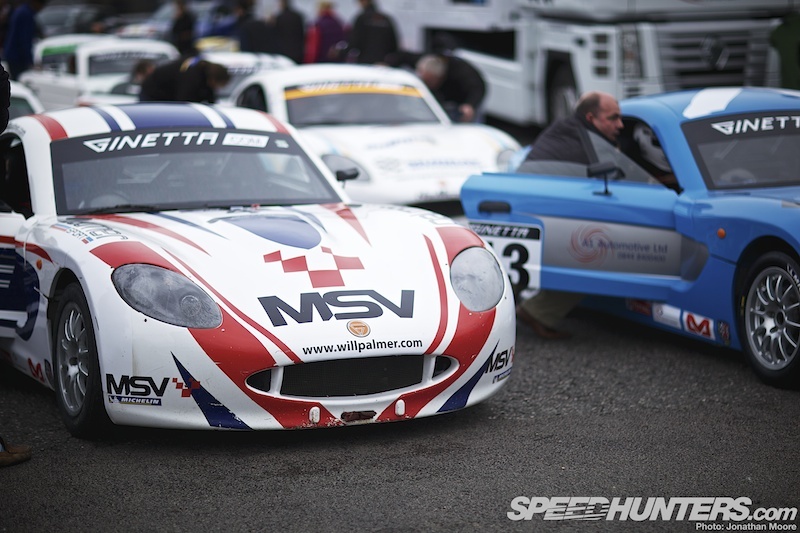 Whereas the GT Supercup is for the pucker G50 and G55 GT cars. 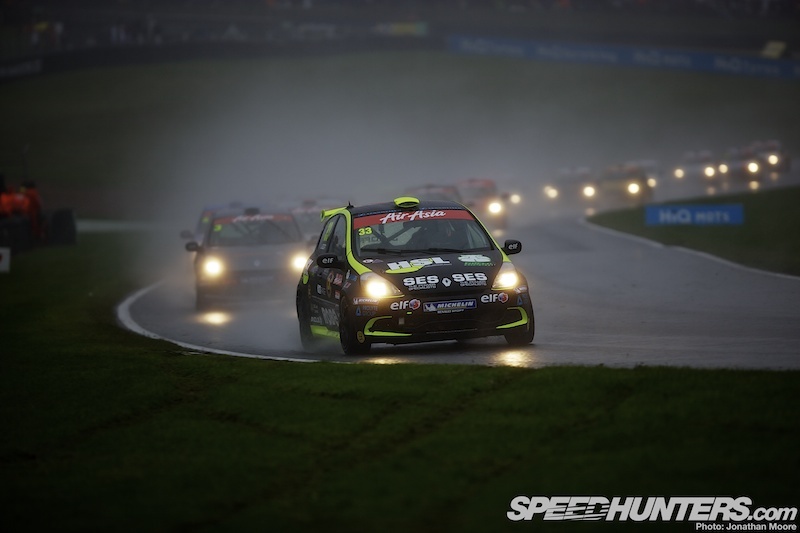 The Clio Cup is one of the most popular entry-level saloon car series: seemingly millions of the things loomed out of the mist at us during their races! The twists, undulations and short blasts of the Indy circuit are challenging enough (this shorter layout was also used for the opening round of the BTCC), but when combined with the Grand Prix extension it’s becomes a much bigger proposition. That said, you’ve got to get to the GP section first. The first corner, Paddock Hill, drops you off the face of the earth: it’s a breathtaking descent with only a sliver of kerb on the outside. If you’re knocked into a spin, it’s almost certainly game over. The only chance of survival is to bury the throttle and try to skate back onto the asphalt. But with the atrocious conditions it was never going to be a walk in the park, and by the end of each race the side of the track was littered with casualties. 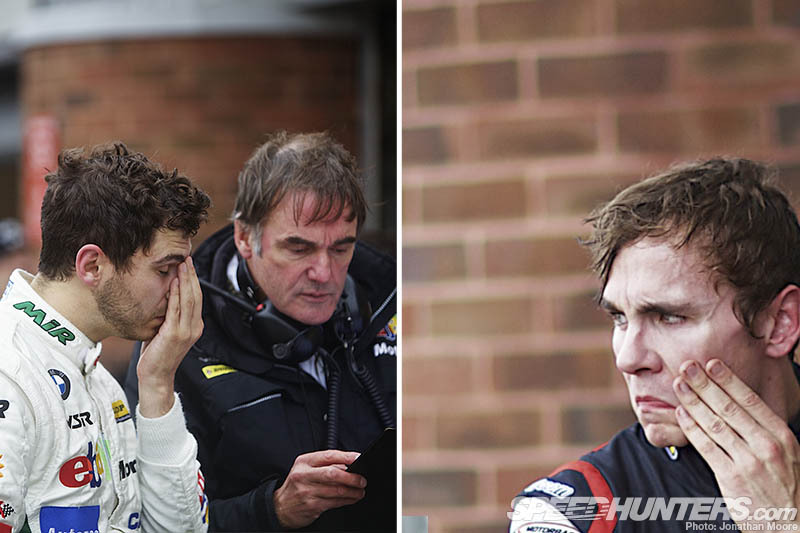 With three races during the day, the pressure on the teams is always immense. 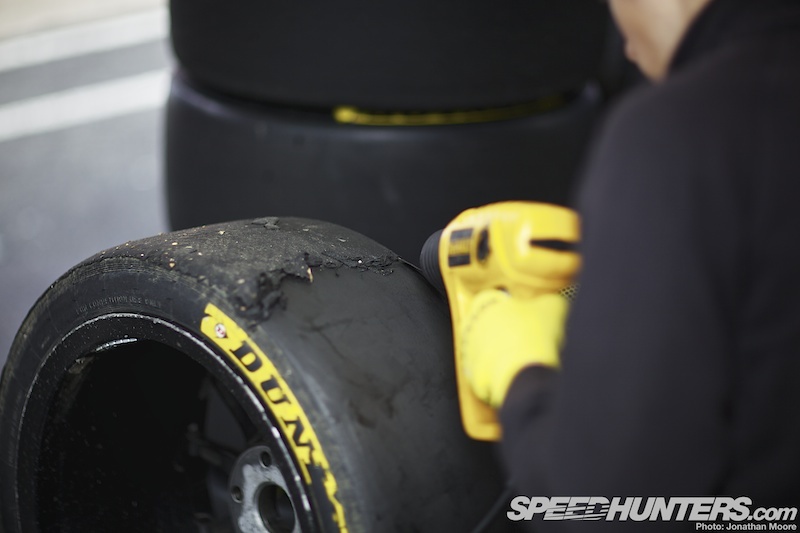 Tyres were stacked up in their dozens everywhere you looked: in garages, behind garages, on top of garages… The slicks only came out to play on Saturday – Sunday was all about rain tyres. 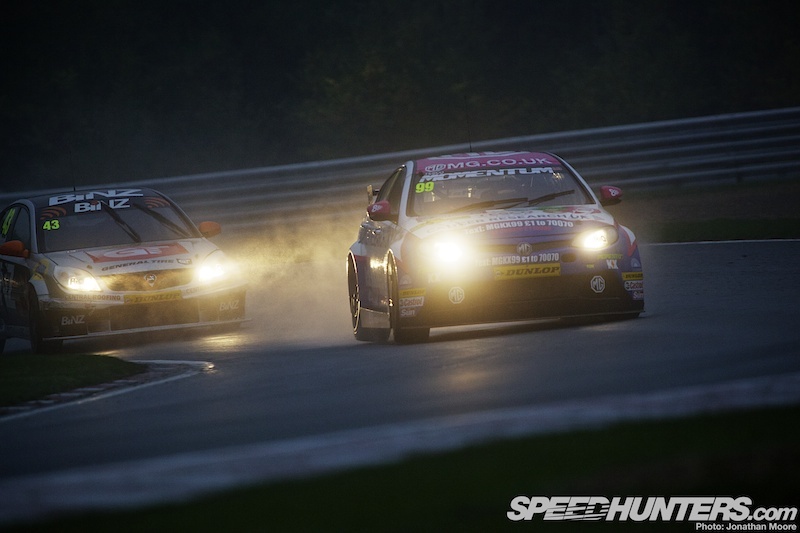 Time is always the enemy in racing, and doubly so in a series like the BTCC. 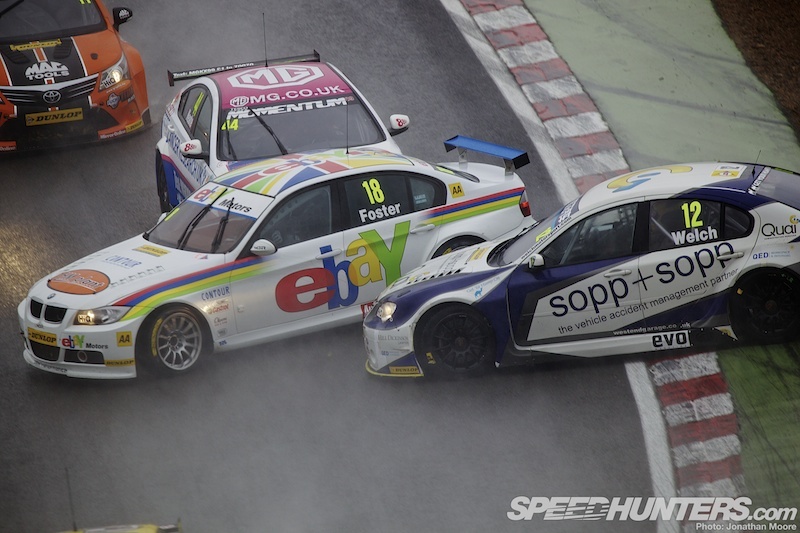 On any given Sunday there’s little time to fix damage sustained during previous races, and touring cars can be like a demolition derby at times. Sometimes there’s only one tool that will do the job: The Persuader. Sunday started damp and just became colder and wetter as the day progressed. Mist hung in the trees in the background of the packed grid. But spirits were high all round, even for those not exactly dressed for the cold weather. Shockingly, the race starts were cleaner than expected, and all the cars made it to the Druids hairpin in one piece on pretty much every one of the three starts. The odd car didn’t make it further than that though. But still, two corners is quite impressive in the middle of this mayhem. 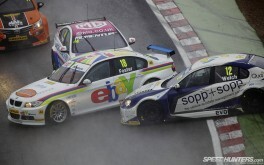 All three races were crackers – cars were twitching under power and squirming under braking, and all in an enormous pack. It really showed the quality of all the drivers. 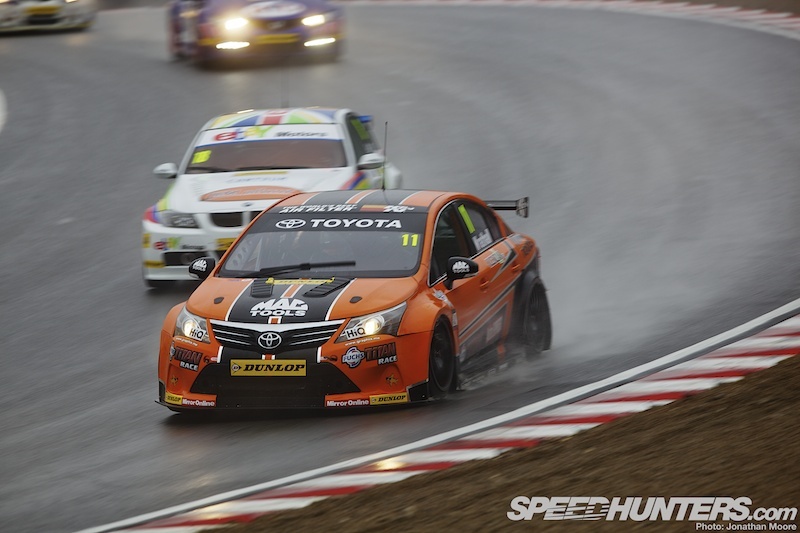 Matt Neal took the first race win to keep himself in the title hunt; most importantly, his team-mate Gordon Shedden finished ahead of main title rival Jason Plato to keep the championship momentum. 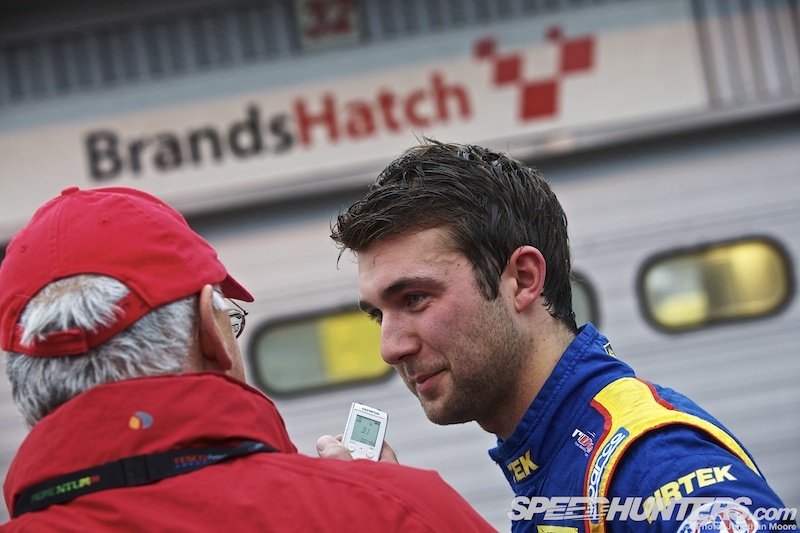 S2000 Focus driver Árón Smith won the second race, his first BTCC victory. 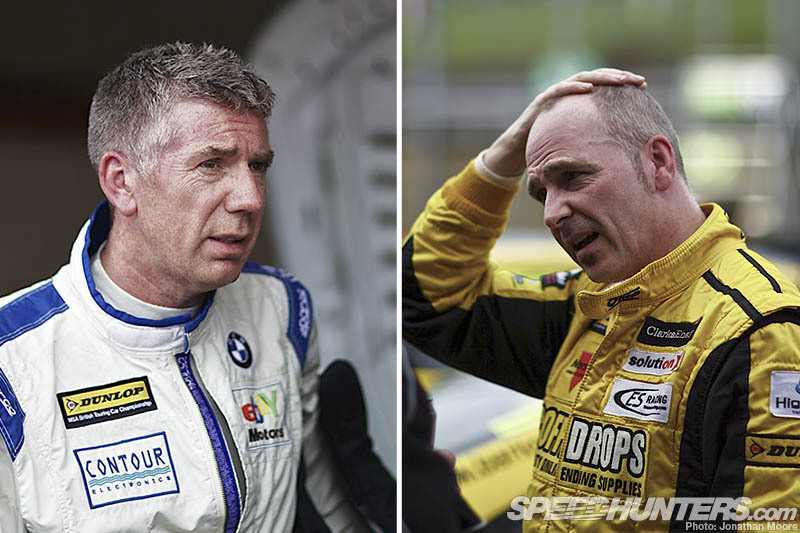 The S2000 BMWs were always fast off the line, and well in the hunt for the first race, but spins and incidents knocked them all out of contention in the second and third races. 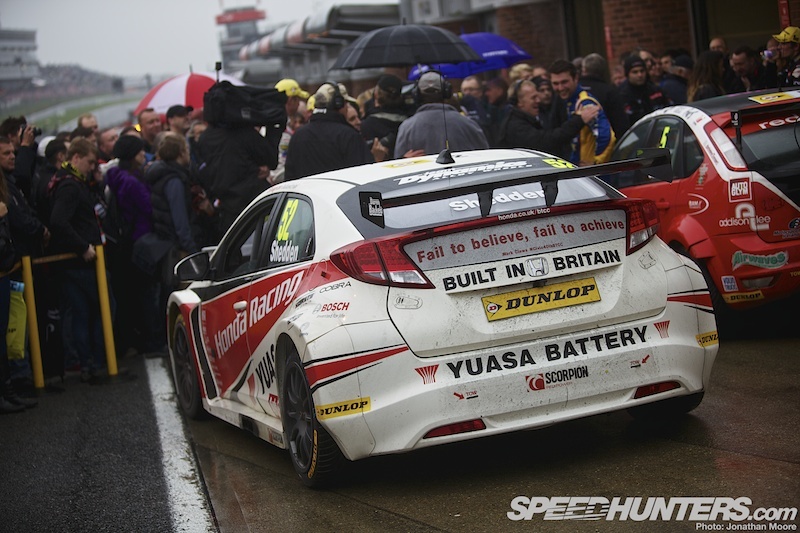 Shedden finished in a strong second in Race 2, backed up by team-mate Neal, which handed him the BTCC 2012 Championship with a race to go. Andrew Jordan’s finished fourth in his Pirtek Civic, which was also the points he needed to secure the Independents trophy. So the gloves were off for the final race of the year, the reverse grid contest. 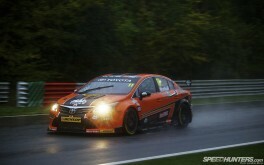 Mat Jackson had drawn the pole slot, but suffered a throttle problem and handed the lead to Wrathall’s Avensis. 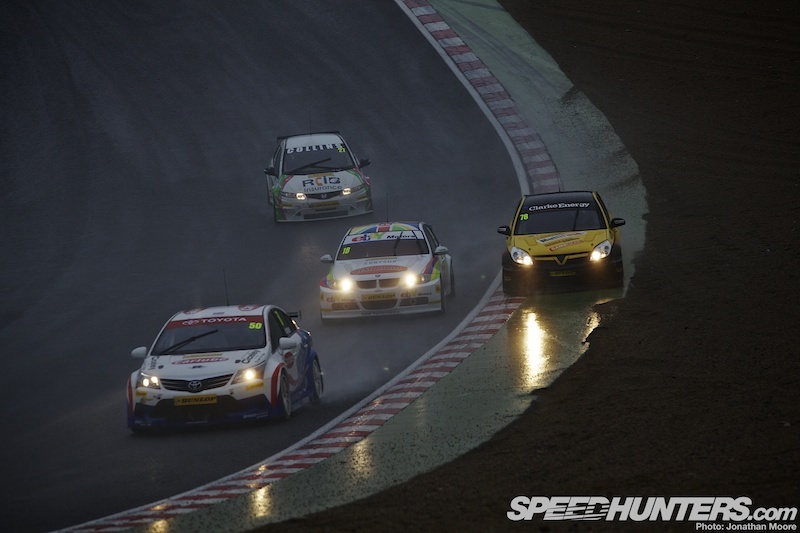 Wrathall pulled away despite the conditions getting worse lap by lap, and took victory from the two factory Hondas – another driver to claim a maiden BTCC win in 2012. 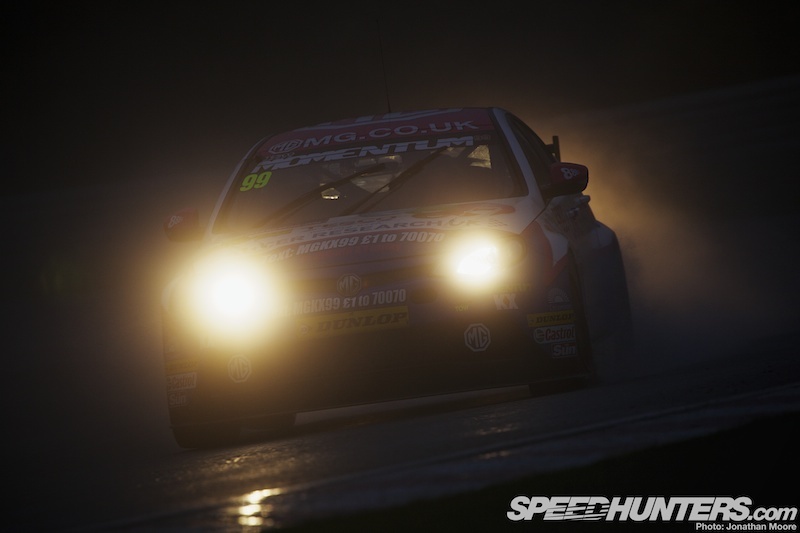 Jason Plato’s MG6 just wasn’t able to cope with the conditions and he fell back to eighth in the race – and third overall in the championship. 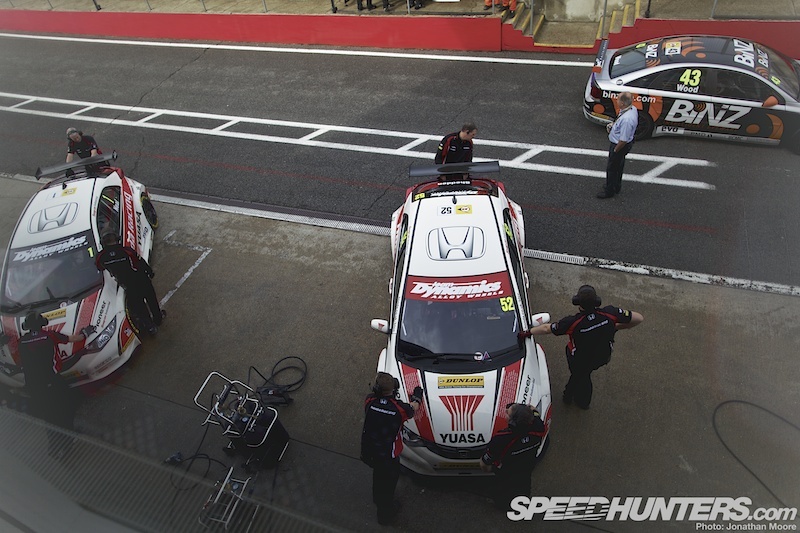 So, Honda claimed a clean sweep of all the available BTCC titles: Drivers, Manufacturers, Teams, Independents and Independent Teams – quite a haul! You can catch up with all three races here – they’re well worth watching! 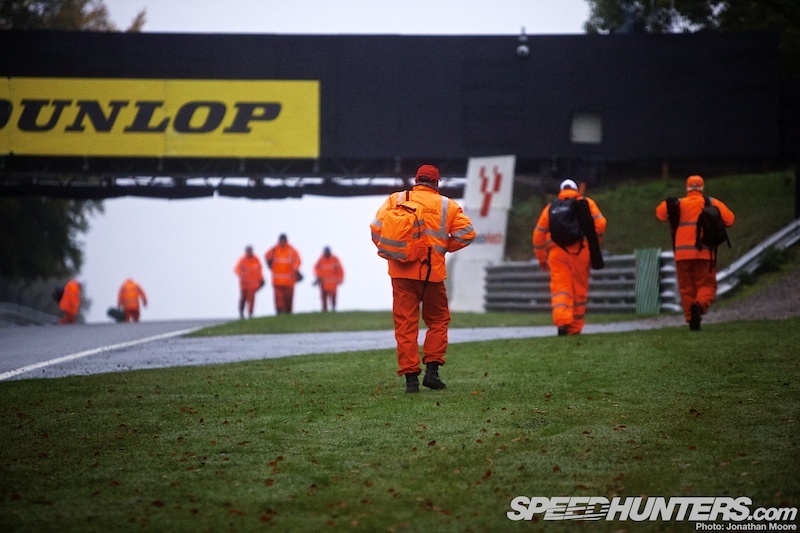 The BRDC marshals did a fantastic job as ever: an army of orange-suited officials kept the event safe and they deserve enormous thanks for the hours they put in, especially in horrendous conditions such as at the Brands finale. Back in the pit-lane the cars stood waiting for their crews to finish dismantling the garage accoutrements – it’s going to be a long five months until the series restarts, back at Brands Hatch next March. Honda go into the off-season having won the title for the last two years, but Triple 8 will be continuing to develop the MG6. 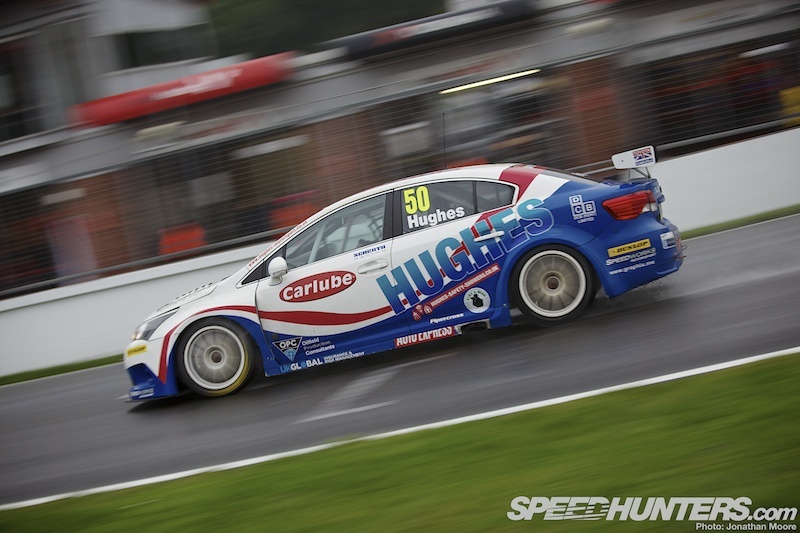 Even more NGTC cars are due to hit the BTCC grid in 2013: a Chevy Cruze is amongst those on the cards. It’s going to be another amazing season! Absolut awesome post! But that's 911 GT3 cup not RSRs. Yep, those are regular Porsche GT3 CUP, the RSR are much wider and have air ducts in the rear fenders (at least the latest 997). 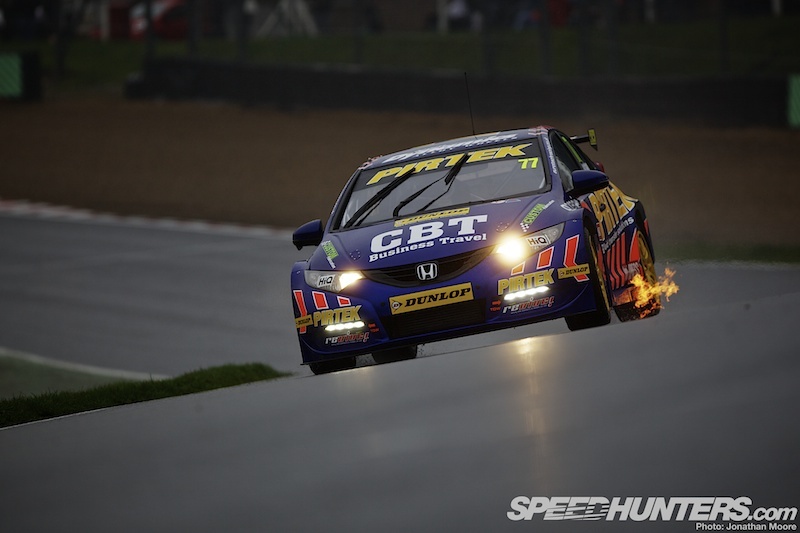 Anyway, Jonathan, you think you could do a feature on the BTCC Honda Civic? That would be great, thanks. S @iller Silly me... a default typo – i'm so used to talking about GT Porsches! @Jonathan Moore Thanks. 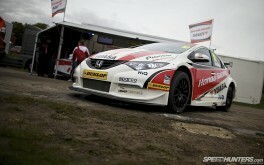 I asked because WTCC will be in Japan, and they have the Civic running. I heard they're using a 1.6L turbocharged, and would like to see some detailed pics. 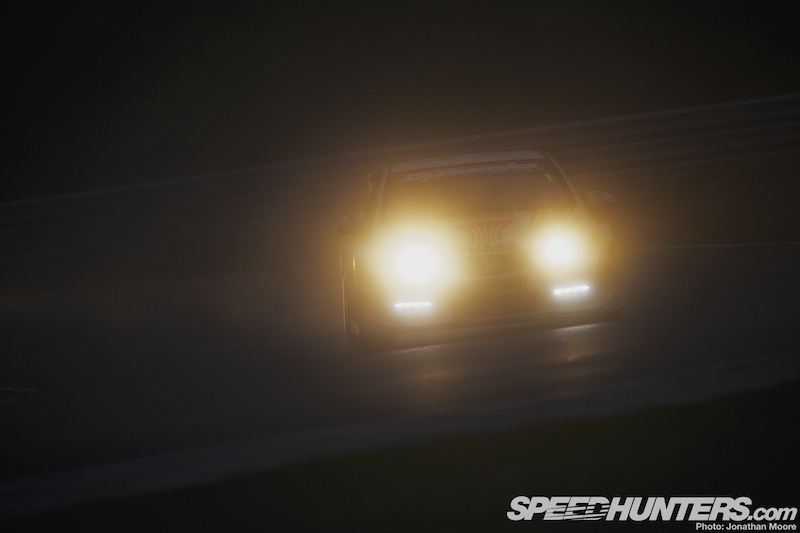 The last pic of Frank Wrathall in the Evensis is excellant, Why no High res? 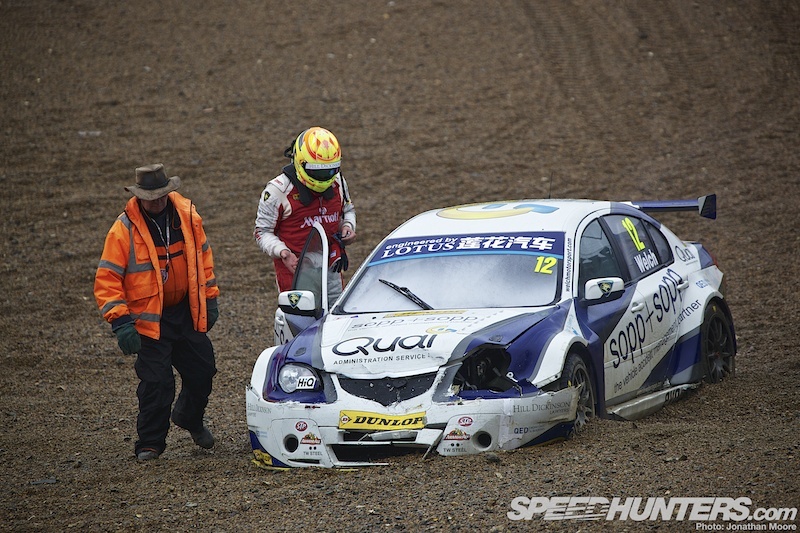 But yet another brilliant season of fast close racing from the BTCC. You should be sent to every race meeting Jonathan. 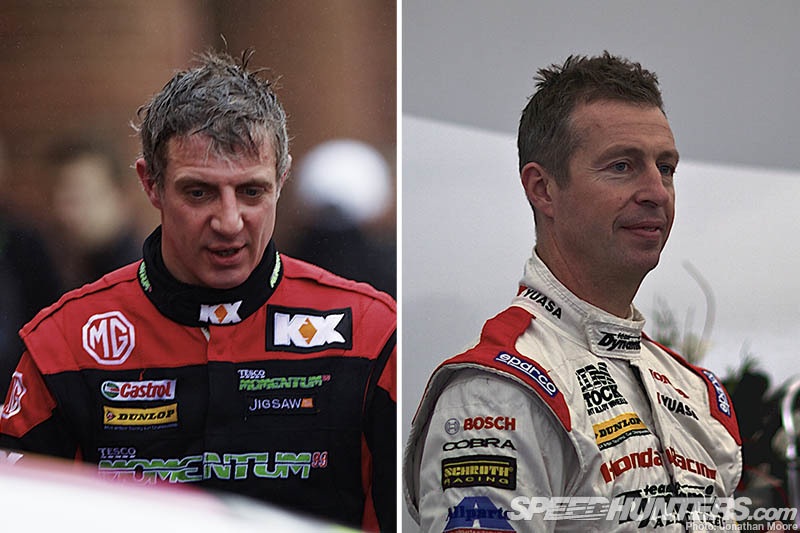 Follow the link for a brilliant Matt Neal & Jason Plato face off at Rockingham, Not for young ears though. Mr. Jonathan, fantastic work and fabulous photos. 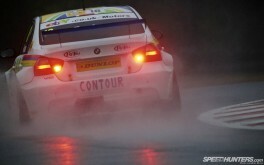 Along with the DTM, BTCC is one of the touring car championships coolest we have in the world. 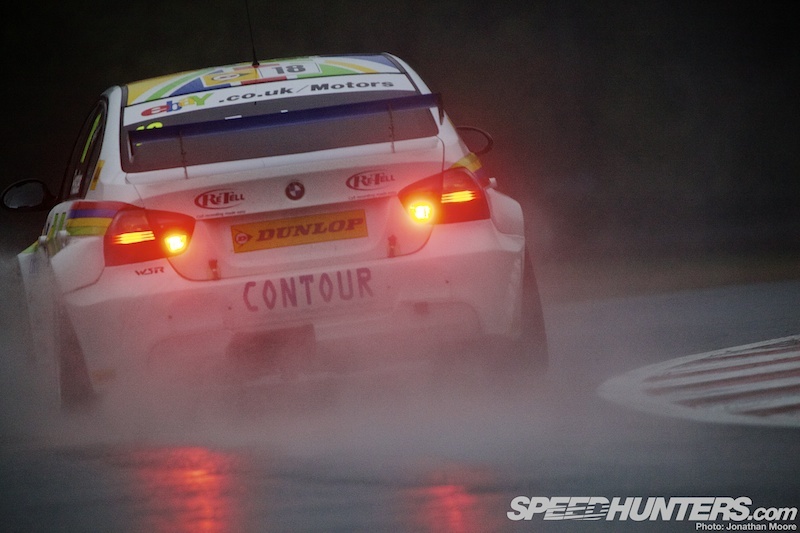 There is just something about BTCC, especially when it rains, that just is not interesting to me. Probably because all the cars are meh. Sorry, but there's better series out there to follow in my opinion. 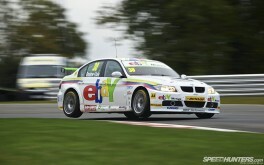 Great coverage Jonathan, its brilliant to see the BTCC getting a write up on here. I really hope the series continues to find its footing and progress. More works teams would really bolster that but given the current economy the series has to be very compelling for them to take enough notice! The wheel to wheel racing in the series is brilliant, even the support Clio Cup series is real cracker (though I would say that haha). Great photos and an excellent article Jonathan. It was a pretty miserable day weather wise, but there was some really good racing throughout the day weather wise. 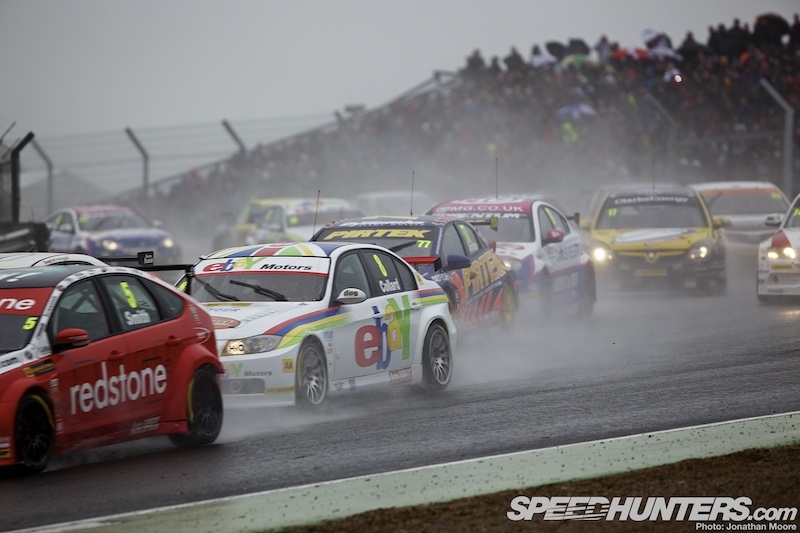 The BTCC may not be as high profile as it has been, but it still provides a great spectacle and some close competition: this was yet another year where the title was decided at the last meet of the season. 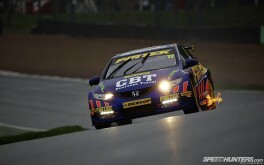 I'm a huge BTCC fan and I'm really happy to see coverage of the series on this site! Deffinitly keep it up! Adds to the diverse car and race coverage! 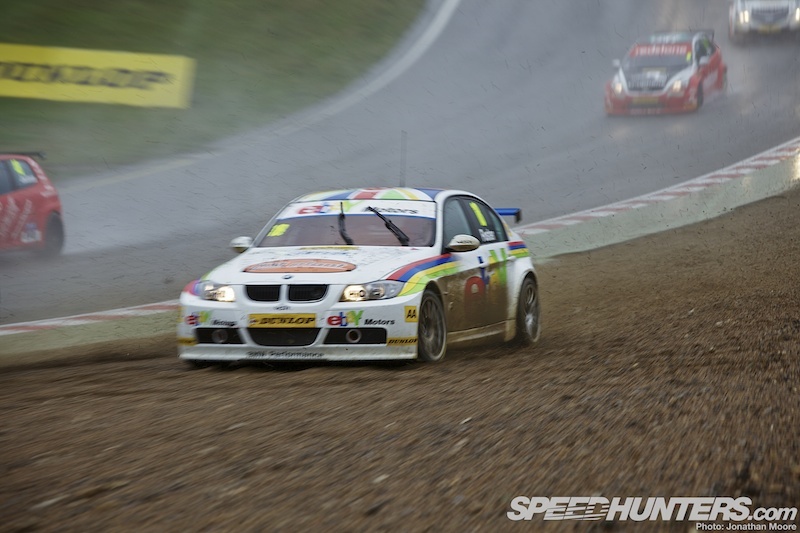 A feature on a NGTC car would be awesome! Cheers guys keep up the fantastic work! @roeby Desktop added. And yes, that link is rather blue, but typical of the Plato/Neal relationship! @Jonathan Moore I'll check, but the Flickr gallery is not private, by contrast, is open. 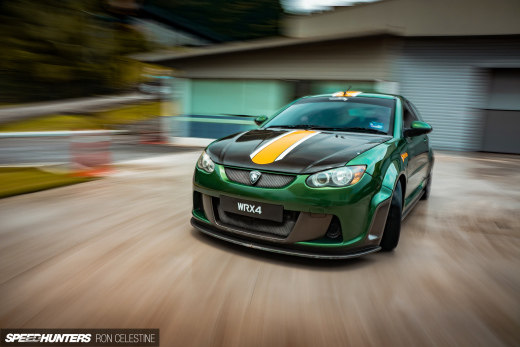 I think the Proton is a Proton Persona. The Persona is a stretched Gen-2.